Estrella Hega is one of the six active members of Mabisa Opa, the people’s organization managing the Mabisa Eco Farm in Lobo, Batangas. Before she became a member of the P.O., she used to be a gambler and an alcoholic. Now, she says she finds peace in Mabisa Organic Eco Farm. But the journey of finding peace do not happen without challenges. With only six people manning the farm, the P.O. acknowledges the trials that hinder their growth. Mabisa Eco Farm has a little hill where both farmers and guests can plant vegetables and rest in the nipa hut atop the hill. The plants and crops need to be maintained every day and with only six active members who take turns with the responsibilities, it is a mammoth task to do. “Napakahirap. Hindi naman po simpleng itatanim mo lang. Siyempre, kailangan niyong alagaan kasi kung hindi aalagaan, mawawalan ng kwenta rin po ang pagtatanim. Hindi po siya tutubo nang maganda upang pakinabangan,” Estrella explained. To solve this issue, ABS-CBN Lingkod Kapamilya Foundation’s Bantay Kalikasan recently partnered with DENSO Philippines Corporation – engaging the latter’s employees in farming at Mabisa Eco Farm as part of its Corporate Social Responsibility. Lobo, Batangas is one of the assisted sites of Bantay Kalikasan. The employees helped in rehabilitating the farm. The volunteers took care of weeding the hill so seeds of squash can be planted along. Some of them repainted the rest rooms, re-varnished the receiving area and training area, and repaired nipa huts. They also planted vegetables such as mustard, pechay, and upo. Employees also replaced the dilapidated net that protects the greenhouse. 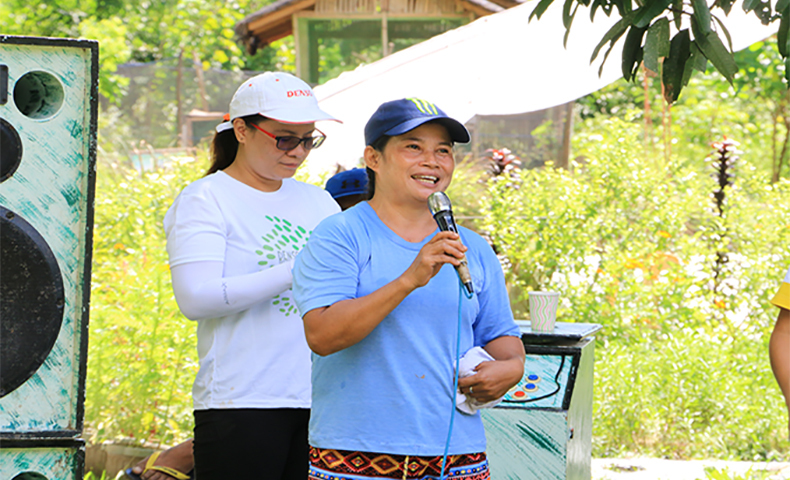 “Given that we have limited personnel involved in the farm operations, it is really a big help that we are bringing people who can help our P.O.,” Ellaine Diomampo, ALKFI-BK’s Site Specialist for Batangas shared. “Iyong pagdating po ng mga volunteer na sila ang gumawa ng iba naming gawain ay napakalaking tulong na po sa amin,” Hega articulated pertaining to the DNPH. Maybe, finding and achieving peace is like farming. You take care of your produce until the time comes to harvest. And perhaps, peace can be attained and found with a helping hand.